Are you looking for a portable and easy to use Paint Sprayer? The Graco 16N673 might be just what you’ve been searching for. If you are hoping to complete some smaller household projects, then you will want to pay attention. Read my comprehensive review to find out the good and even the not so good about this highly rated paint sprayer. What Projects Are The Truecoat Pro II Best For? Before purchasing an electric paint sprayer, there are some things you’ll want to keep in mind. 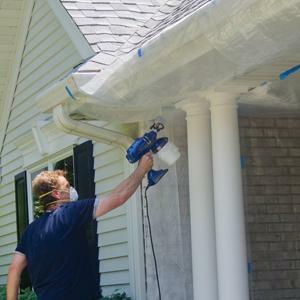 First, an electric handheld paint sprayer is generally used on small projects. Typically you would use the handheld sprayer for a job requiring 1-2 gallons of paint or less. Many people enjoy having a smaller paint sprayer around so they don’t have to drag out their larger versions. This is great when painting a piece of furniture or door. A quality paint sprayer will provide the same finish as the larger models, just on a smaller scale. This is important when you want a professional looking finish. In addition, you will want to be sure you have access to an electrical outlet to plug your paint sprayer in. The alternative is to consider a Graco battery handheld paint sprayer instead. No matter what paint sprayer you purchase, you will want a trustworthy brand. Graco has been the leader in the paint sprayer industry since 1926. They’ve offered premium pumps in their equipment and industries worldwide rely on their name. One of the most trusted electric paint sprayers on the market right now is the Graco 16N673 TrueCoat Pro II Electric Paint Sprayer. It doesn’t take long to figure out what makes this model special. There is no thinning required before using this sprayer. The Tilt-N-Spray pendulum suction tube will provide you with a full range of motion. You can spray up, down or sideways and never lose prime. The TrueCoat Pro II is fully repairable, unlike some other models, so you can extend the life of the sprayer. Your sprayer will come with the 515 TrueCoat reversible tip so you can keep moving even when there is a clog. It also features a 32-ounce cup with cover, 5 liners, pump armor storage, start-up tool, instructional DVD, and storage case. Use this sprayer to apply a wide range of coatings including stains, heavy latex, and acrylics. The maximum tip size that can be used with the Graco electric paint sprayer is 0.17. The maximum pressure it will produce is 1000-2000 PSI. In addition, the manufacturer only recommends that this gets used up to 50 gallons per year. If you would prefer a larger model that get handle more gallons then the x5 is a better option. The Graco Truecoat Pro II has been a fantastic performer over the years. The Truecoat has been discontinued and the latest model is the Graco Ultra Corded Airless Handheld Paint Sprayer 17M359. This sprayer offers all the features stated in this review along with better quality pumps and tips. Check it out below! Many users have found this electric paint sprayer to be helpful with projects like walls, garage doors, shutters, furniture, railings, and decks. I also recommend the Trucoat Pro II on smaller surfaces. Instead of bringing out their larger Graco paint sprayers, they can get this out easily and complete the project quickly. At just over 8 pounds, it is perfect for using most anywhere you need to paint. The reversible tip helps maintain the ability to spray quickly, even when clogging problems arise. This is an excellent feature to have when spraying cabinets. Just switch or reverse the tip and keep going. The large cup means plenty of paint can be stored and sprayed in one go. Another quality aspect that allows you to get the job done at speed. The biggest thing this handheld sprayer has going for it is that Graco makes it. All Graco paint sprayers seem to be of the utmost quality. While many paint sprayers cannot easily be repaired if something goes wrong, that isn’t the case with the Graco 16N673 TrueCoat Pro II. The entire sprayer is fully repairable in case something would break. This will extend the overall life of the sprayer. It is also lightweight making it easy to paint just about anywhere. Unlike other sprayers, you won’t need to thin your materials before spraying and it can even handle heavy latex paints. Finally, the 515 TrueCoat reversible tip will keep you painting despite a clog. The most important thing to recognize is that this sprayer is only intended for smaller painting projects. It isn’t designed to paint entire houses and is only recommended for jobs that require 1 or 2 gallons of paint at a time. With that being said, it seems slightly expensive compared to other similar paint sprayers. It would be argued that you are paying the extra because it is from the Graco brand which offers some additional peace of mind. If you are looking for a paint sprayer that you can use during your smaller household projects and you don’t mind spending the extra money, the Graco 16N673 TrueCoat Pro II Electric Paint Sprayer would be the way to go. If you are going to need something for bigger projects, it would be wise to look at some of the other Graco brand paint sprayers.